It’s common knowledge that Apple redefined the world of mobile phones with their first iPhone. But is something like that possible today in the world of laptops and tablets? Quite often we underestimate how much change one iteration of a device can bring to the whole industry. This year, Google announced they’ll be bringing Android apps to Chrome OS, and of course Yalantis is interested in opportunities it would mean for our Android team and the industry in general. What does the tech community think about bringing Android apps to Chromebooks? Many people consider this announcement a sign that there might be a wider merge betweenChrome OS and Android coming. This will mean that all users of Google’s operating systems have one place to look for apps, and developers can easily create software for all Google products. After being announced in 2009, Chrome OS had a slow route to success. Even a few years back, not many of us thought of Google as a major creator of PC operating systems – but that might be changing. The first Chromebooks (running Chrome OS) came out in 2011, but the OS itself needed a few more years to mature and really take off. Today, nobody’s surprised that the Chromebook market is growing, and in fact it’s already reached a point where it’s a force to reckon with. In the first quarter of 2016, more than 2 million Americans bought laptops running Chrome OS. Global Market Insights predicts that by 2023 annual global sales will exceed 17 million Chromebooks. Why are Chromebooks so popular? To understand what makes Chromebooks so popular, we need to look at how they were initially marketed – as simple, even ‘basic’ personal computers that offer Google’s software products and smooth web browsing for a very appealing price. The North American market embraced Chromebooks as a cheaper alternative to other laptops, and more than 84 percent of all Chromebook sales have been in the US and Canada. The rapid growth of the Chromebook market was in many respects powered by their popularity in the education sector. 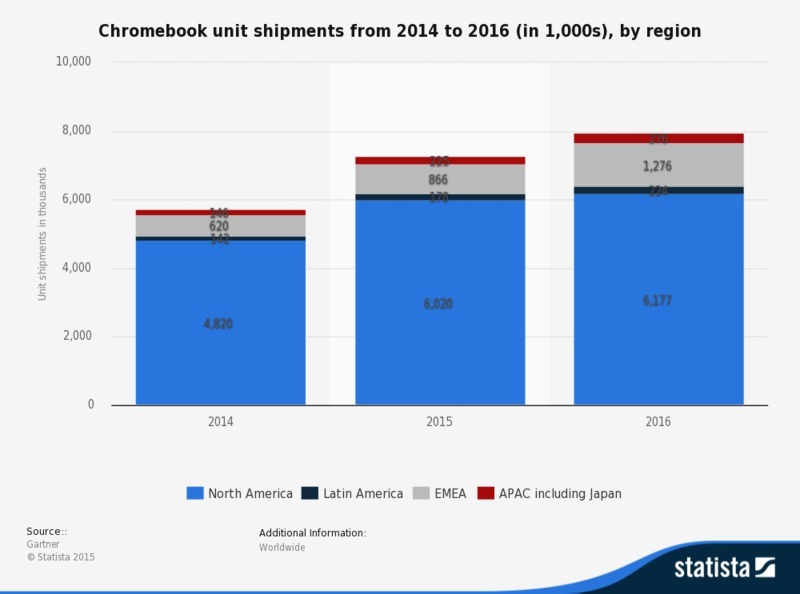 In North America, up to 60 percent of all Chromebook devices have been sold for use in education. Their biggest competitor – Apple’s iPad – has been losing out in this sector because Apple is used to operating with high profit margins, and schools are generally on the hunt for more affordable options. One more notable difference between Chromebooks and iPads is that Chromebooks are cloud-based and account-based by nature, whereas iPads are generally considered ‘single-user’ devices. This distinction also makes Chromebooks a better pick for educational institutions. Another consideration for educational institutions is security. With Chromebooks, schools can have full administrative control over what their students’ accounts can and can’t do, which makes already-safe devices even more appealing. Android vs. Chrome OS: what are the biggest differences? Chrome OS is cloud-based: all user information, preferences and app data are stored in the cloud, and is accessible from any Chrome OS device. Chrome OS is less fragmented than Android, and every new version of Chrome OS will work well on every Chromebook device. Chromebooks are designed to be little more than regular laptops that access web pages using Google Chrome – they don’t run native apps in the same way that Windows, Mac, or Linux does. This means most viruses and malware are not a threat for Chromebooks. Chromebooks are more secure than other laptops because they have fewer bugs that can be exploited and there are strict limitations on what can be installed on them. Chrome OS is optimized for keyboard and mouse, which is beneficial for many types of software. Speech-to-text solutions are far from perfect, and as a writer I can tell you there’s nothing that pains me more than needing to type for a couple of hours just using my tablet’s touchscreen keyboard. What limited Chromebook’s invasion of the laptop market in the past? In 2016, only about 1.1 percent of Chromebook devices in North America were used by businesses. Why is that and how likely is it to change? Many businesses rely on licensed software that hasn’t been made available on Chrome OS so far. But in fact, quite a lot of software that won’t run on a Chromebook is available for Android. To give you an example, I’ve used the Skype app on my Android phone for a few years now, but I still can’t video chat via Skype with my grandma, whose only device – a Toshiba Chromebook – can’t run Skype. Now that the Google Play Store is coming to Chromebooks, however, you’ll be able to easily fire up the Skype app and make that call to grandma or to your international client. And businesses that have subscriptions to Office 365, for instance, may be able to switch to newer, cheaper devices without losing any functionality or quality. Software like Word, Excel and PowerPoint has become essential for many businesses, and will soon be available, in the form of native Android apps, for Chromebook users. What does this change mean for users? To create a truly comfortable environment for a user, we need two components: capable hardware and a software development community that’s willing to build high-demand apps for a particular OS. We know from recent history that both of these components are necessary for success: Windows phone lacked a software development community – and failed to compete with iOS and Android. Even recently a lot of people were saying that Chromebooks wouldn’t go much further because they lacked a development community, but that is quickly changing. At I/O in 2016, Google showed examples of Android apps running on Chrome OS, and it was impressive. 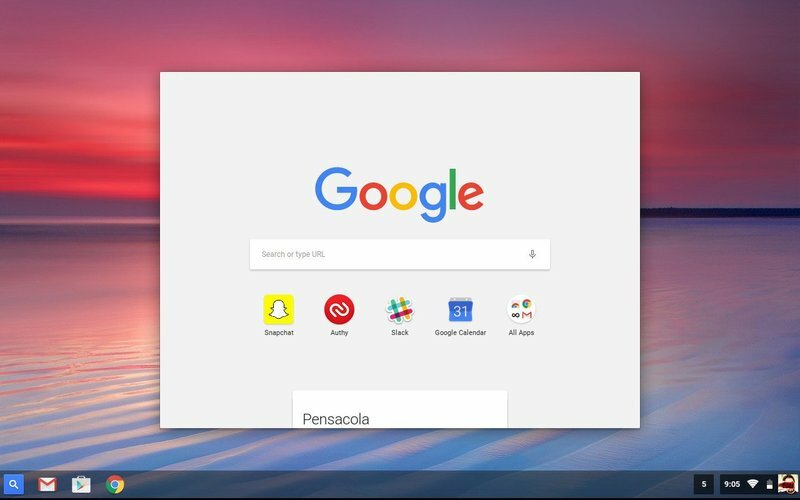 According to Google, Android apps on Chromebooks can be displayed in three different window sizes, which lets users multitask while also using the Chrome browser. Android apps running on Chromebooks will have access to keyboards and touch input, and will even show notifications. From a user’s perspective, this means that we’ll be able to enjoy all of an Android app’s features while working in multiple windows at the same time and not relying solely on a touch keyboard. Bringing Android apps to Chromebooks also means that Chromebooks will soon have one of the biggest developer communities creating apps for their OS. All together, it means that if you own a Chromebook that supports (or will soon support) Android apps, the days will be over when you had to constantly use a laptop AND a smartphone to access all the apps you need – since both types of devices will ultimately share the same software. Of course, there’s still a question of user experience. Certain Android apps are better suited for smaller screens or touchscreens. At the same time, web apps often provide a better UI when it comes to navigating through menus, editing texts and images and so on. Google Docs is an example of an Android app that – even though it has significantly improved over the last year or so – is still inferior to the Google Docs web app. Slack’s web-based version is also much easier to get around, with more information accessible on a bigger screen. In short, bringing Android apps to Chromebooks will require a new approach that will change design principles for Android apps. Certain Google Chromebooks now support Android apps from the Google Play Store, but changes have to be made before we can talk about fully using all Android apps across a range of Chromebook devices. What do developers have to do if they want to bring their apps to Chromebooks? Google provides support for the most common window layouts – portrait, landscape and maximized – and implementing Android apps on Chrome will require multi-window support. Google recommends testing new apps to ensure that they handle changes in window size appropriately. Some Chromebooks are touch screen, but most still aren’t. While some may double as a laptop and a tablet, others have the classic laptop look with a physical keyboard and trackpad. This means that developers should include support for physical keyboards and support shortcuts that are commonly used while typing. Chrome OS initially requires apps to support Android 6.0 APIs. But it's a good idea to plan support for APIs and behaviors available as of Android 7.0. Android 7.0 brings several relevant improvements, including better multi-window support and access to APIs for drag-and-drop operations across apps. Significant change takes time, but it is likely that bringing Android apps to Chrome OS will likely bridge the gap between two operating systems enough to open new opportunities for app developers.